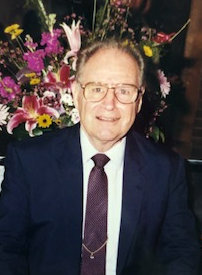 Funeral services for Alvin Henry Woods, 89, Fairhope, Alabama, will be held at 2:00 p.m., Saturday, April 6, 2019 in the Rose Chapel at Robertson-Drago Funeral Home. Mr. Woods passed away at 11:35 a.m., Friday, March 29, 2019 at his home. He was born August 22, 1929, in Howell County, Missouri, to Joseph Henry Woods and Lola May Newman Woods. On June 20, 1950, he was married at Miami, Florida, to Laura Ann Deatherage. Mr. Woods was a veteran, having served with the United States Navy during the Korean War. Mr. Woods worked as a civil engineer at Chicago Bridge and Iron Company for 40 years. He loved woodworking. He was always a hard worker, even after retirement he kept busy. He took loving care of his wife during her 14 year illness and passed that caring nature on to his family. Mr. Woods was a member of 3 Circle Church. He is survived by one daughter, Angela Puckett and husband, Dr. Ken Puckett, Fairhope, Alabama; three grandchildren, Noah, Luke and Grace Puckett; and his niece and nephews, Joe Francis, Dr. Ted Deatherage, John Deatherage, Dr. Joseph Deatherage, Dr. James Deatherage, Dr. Samuel Deatherage and Michelle Tyler. His parents, wife and three sisters, June Francis, Delma Petet and Pauline Pittman, preceded him in death. Burial will be in the Moody Cemetery. Memorial contributions may be made to Compassion International and may be left at Robertson-Drago Funeral Home. My Precious Uncle Alvin, I love you, and admire your life, you held the memories of my Dad, and you and Aunt Ann set an example for me to live by. I will always be thankful to be part of this amazing family (quirks and all) … Thank you for being my Uncle and thank than you for the extraordinary life you have lived, You faded from this world, and slept while we watched, as you faded here, you began to clearly see the Face of Christ.. And thank you for the extraordinary daughter you guided through her life to adulthood, She is precious… and now it is time to rest in the hands of Christ..